It’s only two weeks until the 2018 Fifa World Cup gets underway in Russia and the excitement is mounting! It’s extremely difficult to pick a winner for this year’s tournament, but people around the UK will be relying on the luck of the draw in their office or workplace sweepstakes. Most will have their fingers crossed to get one of the usual suspects, such as Brazil or Germany. Many will embrace a new-found loyalty to rank outsiders, such as Senegal or Panama. 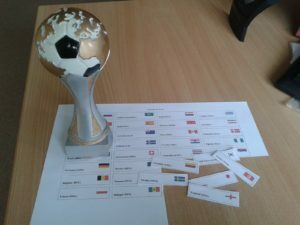 Whether you get a firm favourite, a dark horse or a likely also-ran, the sweepstake adds that little bit more excitement to the tournament, as well as encouraging some friendly(?) rivalry in the office. If you’re taking part in or organising a sweepstake with your friends or co-workers, why not make it a charity fundraiser at the same time? By adding a donation to charity as part of the sweepstake entry price, you can send a little of that World Cup fever to a good cause. Many charities have their own sweepstake kits which you can download or print out from their website. Check out these excellent examples from Great Ormond Street Hospital Children’s Charity, Street League, Action on Hearing Loss and Asthma UK. You can also create your own with crayons or clipart, or download our own World Cup 2018 sweepstake kit. Gift Aid can only be redeemed on donations where the donor is not receiving any goods or service in return. If a portion of the sweepstake entry price is going to charity, this is not eligible for Gift Aid. However, any voluntary donation by participants on top of the entry price is eligible. For more information, see the Institute of Fundraising’s guidance. Who would you like to get? Everyone has their own opinion about which group is the ‘Group of Death’. According to Fifa’s latest rankings, Group C should be the tightest, with two to progress from France, Peru, Denmark and Australia. France will be slight favourites, but Peru qualified from the tough South American group. Denmark overcame a slow start in qualifying and thrashed their group winners Poland 4-0 at home. Australia only qualified via a playoff, but are the reigning Asian Cup champions. Group A, featuring hosts Russia, looks to be the softest, with the highest Fifa-ranked team, Uruguay being just #17 in the world. Egypt (#46), Russia (#66) and Saudi Arabia (#67) will like their chances as well, although the qualifying teams will most likely have to face Spain (#8) or Portugal (#4) in the second round. According to the Fifa rankings, South Korea are probably the team you don’t want to draw. Ranked outside the world top 60, they’ll have to spring an upset just to finish third in their group, with the next-lowest team (Sweden) being ranked some 40 places higher than them. You could also order an appropriate trophy for the lucky winner of your sweepstake – check out the trophy range we have on offer at low prices. Good luck and let us know who you get in your sweepstake!